Spring has come to Sterling Ridge Log Cabin Resort via a Nor’Easter! At Sterling Ridge Log Cabins, featuring some of the best Cabins in Vermont outdoor enthusiasts are excited for this type of spring storm. A late storm like this means winter sports can be enjoyed in warm spring-like weather with 46” of fresh snow! As of now, it looks like skiing will be available well into April! As always, spring in New England brings Sterling Ridge Log Cabin’s 5th annual community Easter egg hunt. The event takes place on April 15 at 4 pm. 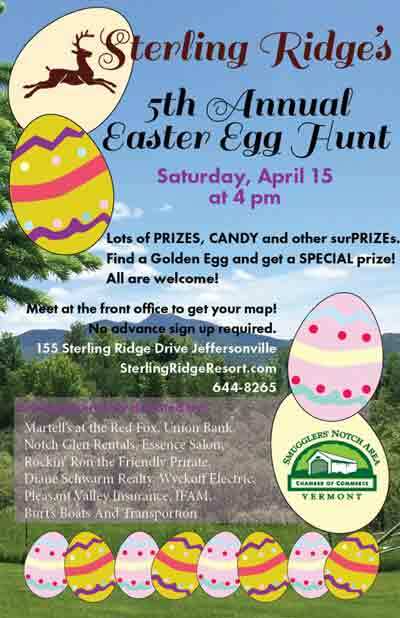 This year many community businesses, along with Smugglers Notch Area Chamber of Commerce, have donated some amazing prizes for those lucky enough to find a golden egg. Last year we had over 100 people, mostly children, of course, attend. We are hoping Mother Nature will cooperate and bring lots of sunshine, warmer temperatures and lots of smiling faces. Spring is not only bringing us snow, warmer temperatures, and Easter egg hunts. We will be revealing, for our 25th Anniversary, a brand new website! It has been refreshed and updated. We love the new availability tool that you can access on each page. It will help you check your dates faster to be sure your favorite cabin is available. We hope to see you this spring at Sterling Ridge Log Cabins and hope you want to take up one of our great Vermont cabin rentals. Don’t forget it is also the start of Off-season rates – the lowest rates of the year!